Indonesian aid agencies and officials rushed Tuesday to help survivors after the third quake disaster in less than a month on Lombok island, where some 500 people have died and hundreds of thousands are homeless. The picturesque island next to holiday hotspot Bali was hit by two deadly quakes on July 29 and August 5. On Sunday it was shaken again by a string of fresh tremors and aftershocks, with the strongest measuring 6.9 magnitude. At least 13 people were killed on Sunday on Lombok and the neighbouring island of Sumbawa, mostly by falling debris, according to the national disaster agency. Drone footage from the village of Sugian, on the hard-hit eastern part of Lombok, showed streets lined with rubble, caved-in roofs and a collapsed mosque. "We are focusing on the basics, provision of shelter materials -- tarpaulins, shelter kits, hygiene kits," said Tom Howells from Save the Children. "We have shipped enough for about 20,000 people over the past two weeks," he told AFP. Indonesia's disaster agency said it was also accelerating efforts to rebuild destroyed homes, hospitals and schools. However, relief agencies fret that access to food, shelter and clean water is insufficient for some of the more than 430,000 displaced by the disaster. "There has been damage to the water infrastructure, which is already quite poor in Lombok due to a lack of ground supply and drought conditions," Howells said. 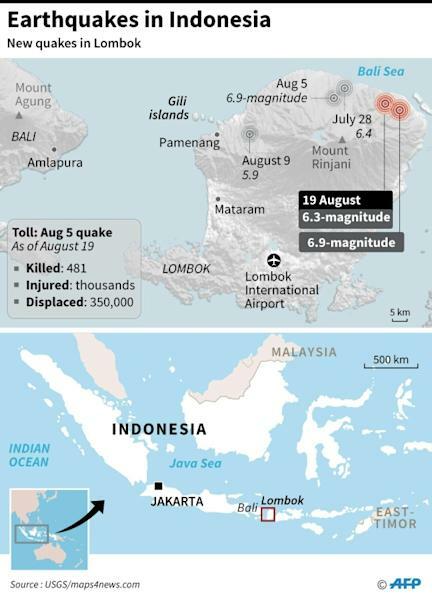 Tens of thousands of homes, mosques and businesses across Lombok had already been destroyed by the 6.9-magnitude quake on August 5 that killed at least 481 people. Some 150 patients at a hospital in Lombok's capital Mataram were being treated in tents after they were taken out of the damaged building Sunday over safety fears. "We heard a sound like the building was cracking and everyone panicked, so all the patients were taken outside," said Andre, a relative of a patient. The hospital had already been damaged in the early August tremor. Most people caught in the latest quake had been outside their homes or at shelters when it struck, a fact which limited casualties, authorities have said. Rebuilding costs are estimated to top seven trillion rupiah ($480 million). 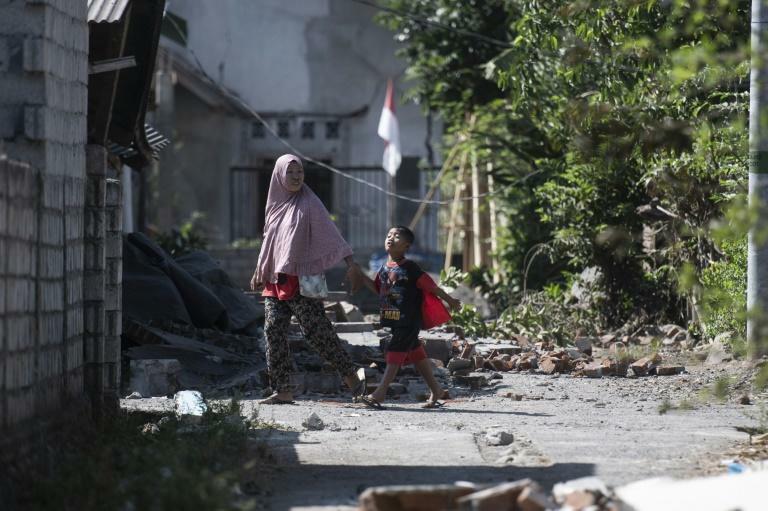 However, the disaster agency said Tuesday that the quakes would not be labelled a national emergency, which would unlock the central government's four trillion-rupiah disaster relief fund. While the idea was gaining support in some quarters, the agency's spokesman Sutopo Purwo Nugroho said it would "show weakness" from a country regularly hit by natural disasters. 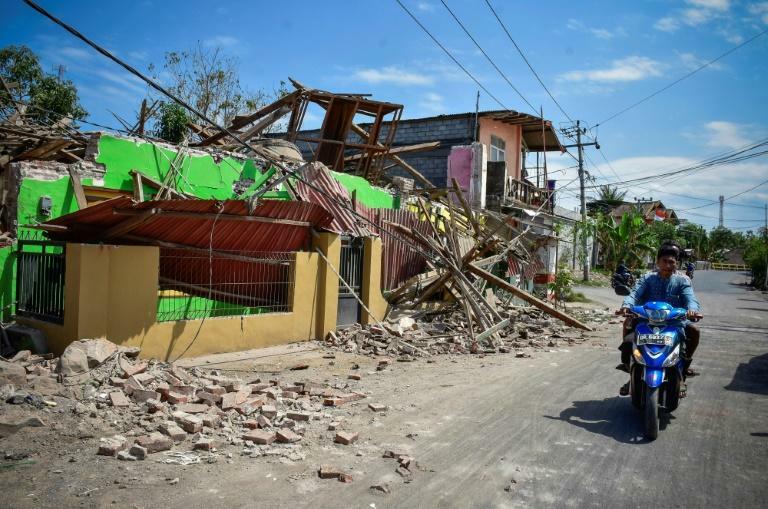 "We want to show the world that we are capable in handling the quakes -- we are strong in responding to disasters," he told reporters in Jakarta. The Australian and Eurasian plates, which sit under the archipelago, have been colliding and putting stress on key area fault lines, according to geologists.